One of our Spring 2016 weddings is featured in the August 2017 issue of Weddings in Houston Magazine available on newsstands soon. 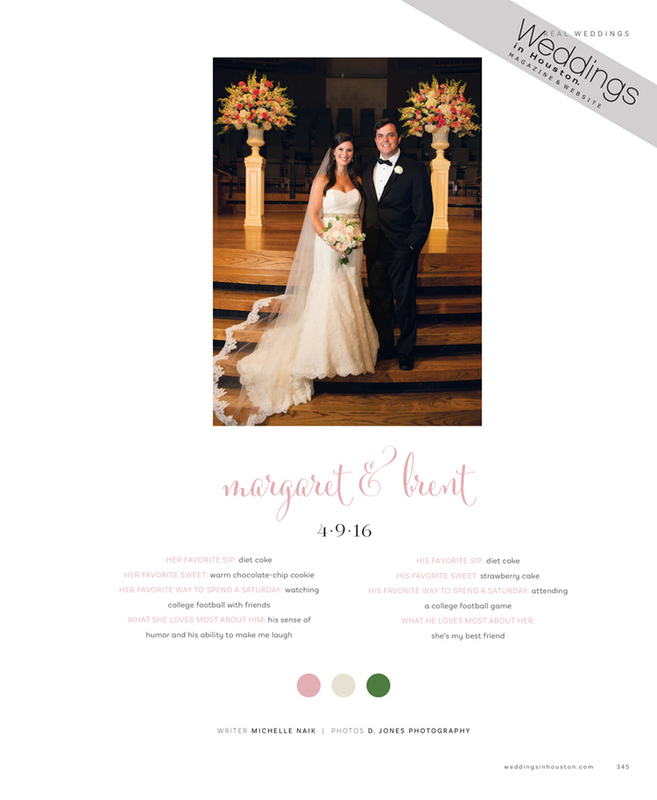 Be sure to check out the wedding of Margaret and Brent in the Real Weddings Section on pages 345-347. One of our Spring 2016 weddings is featured in the January 2017 issue of Weddings in Houston Magazine available on newsstands soon. Be sure to check out the wedding of Alex and Travis in the Real Weddings Section on pages 206-208. We were honored to have been asked to cover the Fall 2016 Bridal Soiree produced by Weddings in Houston Magazine at the Museum of Fine Arts Houston. We are a long time advertiser and we also regularly participate in the show with our booth. As usual there were tons of great vendors and amazing displays by some of Houston’s finest. 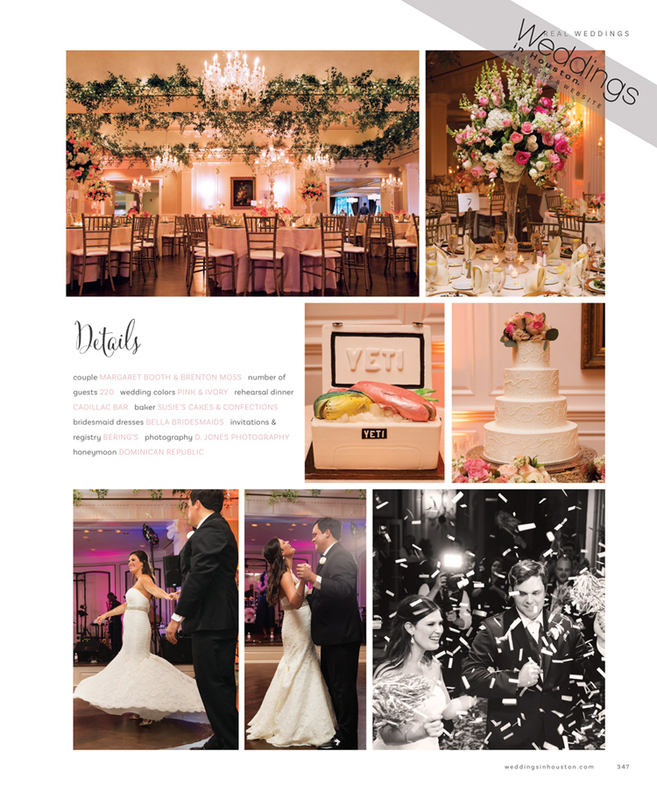 Here are the two pages featured in Weddings in Houston Magazine highlighting the event. This summer we covered the wedding of Frances and Philip at St Cecilia’s Catholic Church and Houston Country Club. It is so much fun working with past clients as three of the bridesmaids were past brides of ours. In fact we covered the groom’s brother’s wedding back in 2011. Floral and decor provided by Susie Miller while the cake was from Marlene Romero. This Summer at our annual NACE Experience Conference held in Ft Lauderdale we were honored to be part of a team award for a wedding we worked on last year. The award was for the Best Team Event of the Year with a budget of $50,000 to $100,000. The two other companies that participated and were also awarded were Claudia de Velasco with A Day to Remember and Lisa Anhaiser with LBL Event Rentals. It was a fantastic experience to receive this in front of 600 of your colleagues in the event industry from across the nation. Here is the wedding of Sara and Nick held at the Junior League of Houston. Decor and florals provided by Blooming Gallery while entertainment was from the Doppleganger band. Event coordination courtesy of Kelly Balfour with Eventology. Here is another spring wedding we covered for Alex and Travis at the Bell Tower on 34th. Linens and decor were provided by Plants N Petals while the cake was courtesy of Edible Designs by Jessie. Entertainment for the evening was from the Chinatown Band. We were excited to be asked to participate in this style shoot for Weddings in Houston Magazine by Claudia de Velasco with A Day to Remember. She coordinated the entire event at Waters Edge in Clear Lake. Gowns and accessories were provided by Mia Couture while linens were from Nuage Designs. Floral, decor and rentals from Flora & Eventi and hair and makeup by Nyoka Gregory Beauty. Lighting and dance floor courtesy of GTX Production and cakes from Susie’s Cakes. This feature is in the August 2016 issue hitting newsstands soon on pages 376-379. A recent wedding was chosen to be featured in the Spotlight Weddings section of Modern Luxury Houston Brides magazine. This time Charlotte and James’s Winter 2016 wedding was chosen and is in the Summer 2016 issue. The magazine should hit the newsstands soon so keep an eye out for it.